It was Easter Sunday, 1978. An early lunch had been eaten; there was just time for a quick blast of fresh air before the relatives arrived for kaffee und kuchen. It was a time of firsts for me. My first holiday without my family. My first trip outside the UK and my first visit to Germany. The beginning – though I didn’t know it at the time – of a lifelong relationship with that fascinating country and its people. I was a fourteen year old school exchange student who, with my classmates, had anticipated with eagerness swapping the mundane routine of life in England for the supposed exoticism of Schladen, in the Landkreis of Wolfenbüttel in the Land of Lower Saxony. My expectations had been confounded, for what struck me most about life in that quiet corner of West Germany was not the differences but how familiar so much of it seemed, from the brand names in the shops to the groups appearing on Musik Laden, the West German equivalent of Top of the Pops. Half a century of British-German belligerence had melted away in the shared experience of Kate Bush and Boney M, of teenage hormones and new best friends. All this was about to be put into its geopolitical context. We piled into the Wolter family Mercedes and took off down the Schladen-Hornburg road, a route I had already travelled a dozen times during my short stay. Halfway between Schladen and the picturesque medieval town of Hornburg itself Herr Wolter made an abrupt right turn, taking a route that was narrower than the main road and which, after a short distance, became narrower still. The reason for this soon became apparent, for the road didn’t lead anywhere. Not any more. Though the village of Göddeckenrode could be seen clearly in the distance, it could not be reached. The way was blocked by a wire fence, a ploughed strip, soldiers – in short, the chilling paraphernalia of the inner German border; Churchill’s Iron Curtain in all its forbidding glory. It wasn’t merely the fence, or a minefield, nor even the East German border guards barring the way; all the tectonic might of the East-West standoff rendered that country road to Göddeckenrode impassable. We pulled into in a little car park to the left of the road, just below a wooded rise on which stood a concrete watch tower. As we got out of the car the guards in the tower kept a wary eye on us – an unsettling experience, made surreal by the litter bins and advertisements for western ice cream brands that gave the car park something of the atmosphere of a tourist destination. We didn’t stay long; the brute fact of the Iron Curtain aside there wasn’t much to see. I remember thinking that all the cozy familiarity of western life came to an abrupt end here. This was the end of the world. Later I learned that it wasn’t quite that simple. The previous autumn had been among the least cozy in West Germany’s brief history, as the authorities played a bloody game of cat and mouse with the Red Army Faction guerillas. And the western world of Abba and McDonalds, of Volkswagen and Adidas – my world – didn’t end quite as abruptly as I thought, for though the products themselves were not available in the east, the iconography of capitalism was. West German TV ensured the brand names were beamed freely into East German homes. Even so, Göddeckenrode was as physically remote as Vladivostok, though it lay a scant few hundred metres beyond the border. It took me 29 years to finally reach that East German village. On a drive through Germany in the summer of 2007 I stopped for old times’ sake in Schladen. The farm where I had stayed, the nearby inn, even the village itself – all seemed familiar and unchanged. I wanted to see Hornburg again too, but before I got there, an unremarkable-looking side road caught my eye; though a quarter of a century had passed I recognised it immediately, and I turned right off the Bundestrasse 82. The topography had changed little: the same low, wooded rise, the same flat foreground. But the political landscape had changed utterly. 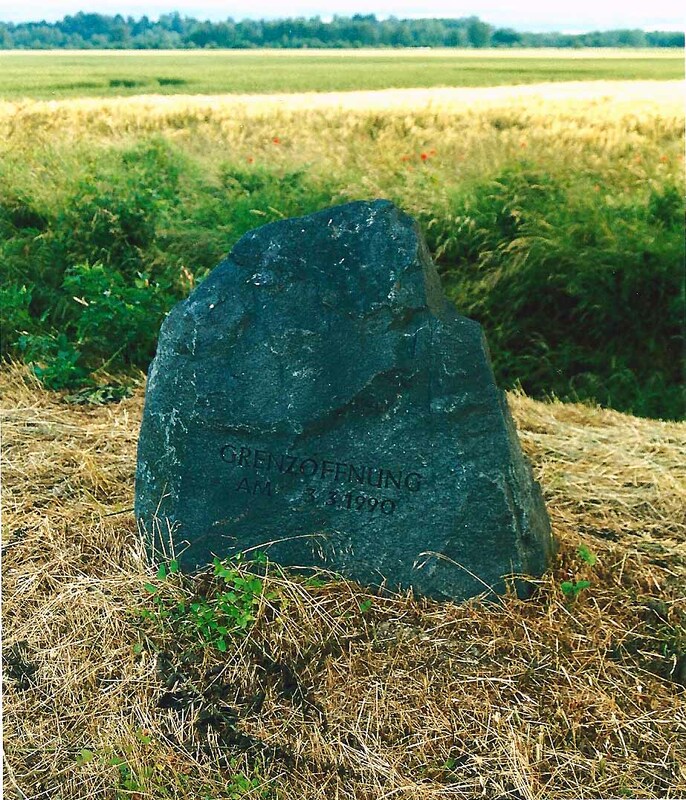 Where once a fence and an army had barred the way, a simple stone now commemorated the reopening of the German-German frontier. As memorials go it was a little too low-key for car parks or ice cream advertisements. But the few minutes it took to drive the short distance into the village beyond it felt inexpressably momentous.